and dramatic vistas. I’m drawn to nature. business world and as a community volunteer, she has been a professional artist for 4 years. I have spent my life studying, teaching, and making art. What inspires me to pick up a pencil, brush, or pen, and make marks on paper or canvas is the same now as it was when I first started out as an artist: color, pattern, and flattened space. For me, color needs to be as intense and bright as I can make it. I want my colors to be exciting, like opening a new box of crayons on the first day of school. My work is flat and decorative. I am mad for pattern, texture, and interesting marks. I like the movement they create in a drawing or painting and the way they activate the surface by breaking large shapes into smaller colored spots. Although I draw from life, I make a conscious effort to flatten the space in the picture plane by tilting it toward the viewer and altering the perspective. The objects looked stacked, one on top of the other, vertically, rather than one behind the other, horizontally. There is also an element of "storytelling" in my work. The objects I draw and paint are objects I touch or use every day--objects perhaps unimportant to others, but which have meaning for me beyond my finding them interesting or beautiful. These objects evoke stories from my own memories or sometimes stories I make up about them. I find these stories funny or whimsical, sometimes sad, sometimes silly. We all struggle, I think, daily, with horrors in the news and difficulties in our own lives. In my drawings, there is no cruelty or violence, no war or hunger or pain. I am aware that this is not the real world, but I want the viewer to forget all that if only for a moment. I want my work to be a feast for the eyes. Saundra Smith Rubiera is a North Carolina artist who works in colored pencils, markers, acrylic paints, and linocuts. She has an MFA degree from East Carolina University with a major in painting and a minor in printmaking. She is a retired art teacher and has illustrated three published books. 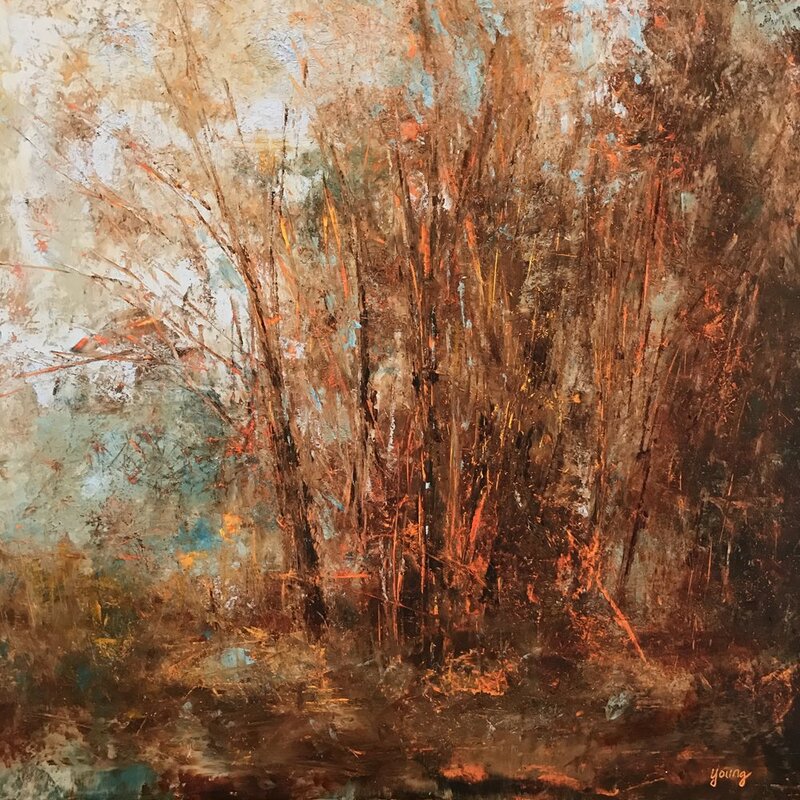 Saundra’s work has been exhibited in national, regional, and local shows. Her business, Dancing Lady Designs, creates custom art and furniture for children’s rooms. Saundra was a 2017 recipient of an Individual Artist Grant. The grant funded the framing of this travelling show which has been shown in six locations throughout the state. The Regional Artist Project Support program is administered and funded by the Arts Council of Fayetteville/Cumberland County with support from the NC Arts Council and the counties of Lee, Moore, Richmond, Robertson, and Scotland, the City of Fayetteville, Cumberland County, and private contributions. Jane Cheek is a mixed media artist who works in an abstract expressionist style. She enjoys working with bright colors, metallic accents, and texture to create art that plays with whimsy and elegance. Jane is interested in using the balance of artistic opposites to represent the balance of emotions she has as a survivor of child abuse with a happy life as an adult. She finds joy and inspiration in nature, her three exuberant children, her amazing husband, and the wonderfully supportive and loving people in her life. When you look at Jane's work you might notice the unmixed colors of Fauvists like van Gogh paired with the simplistic playful shapes of expressionists such as Miró and Kandinsky. In her works with craft and sculptural elements, you may see influences of Janet Echleman and Juame Plensa. Jane's work is a daily practice of seeking and creating joy. Jane attended North Carolina State University where she received a BA in Visual Arts Applications. After graduating, Jane taught art for five years at a K-8 charter school in Durham while working in her home studio and began selling work at local art fairs. She took a few years off while her children were newborns and then resumed work in her home studio. Jane’s work is currently on display at Read With Me, Emily & Co, and Lavish. When she isn't working on art, she and her family can be found living the unschooling life at local parks, and museums, and traveling as often as possible. In this collection I am exploring contradictory artistic elements. I am working with the relationships between opacity and translucency; two dimensions and three; structure and complete abstraction; whimsy and elegance. I have used these elements to explore the contradictions between my own past as an abused child and my present as a happy mother, wife, and artist. I used bright colors and metallic accents to create happy expressionist work because I have chosen to seek and create joy in my life. Twelve years ago I started my own graphic design business. In-between design assignments, I paint. Contemporary impressionism best describes my style. Like the early Impressionists, it is my fascination of how light interacts with form and color. The final result is not a representation, but instead my interpretation of the subject. Simplifying the moment and making the most impact. As an artist, I try to embellish on this and create a piece that is unique and appealing to the viewer. I'm not cool enough to talk about myself in the third person. I'm a photographer, original from the northeast(New Jersey and Massachusetts), that has landed in Apex, North Carolina. I shoot people. I love conceptual. I want my photos to be dynamic, to shape a perception, whatever you feel it might be. I do not have formulas and I never went to art school. I won't be able to explain or defend my work with gregarious themes and deeper meanings. I subscribe to the idea that you can just shoot something and like it. It doesn't have to go further than that. If you find something deeper, kudos, I've done something to elicit a response. I suppose that's what art is about? My photographic inspirations are Ritts, Lagrange, Blumenfeld, Wolf, Avedon and Walker. I don't think my work necessarily looks like their images, but they drive a lot of what I do. When I paint, I paint abstract memories. Sometimes the memory is foggy and has been replaced by an imaginary sediment, a residue that has made one memory solid and the other fluid. Everything in art is a memory. I have empathic traits, therefore I paint the images of the emotions that I am able to absorb from strangers and from those who surround me. The only expectation that I have from my art is pleasure. Helen Seebold's skillfully made ceramics filled United Arts Council for the months of March and April 2016!